How safe are modern protected bike lane intersections? They’re so safe that the conflict rates between bikes and motor vehicles are too small to fit on tables — there are too many decimal places. When the first academic study of U.S. protected lanes came out this week, researchers had to concoct a special index rating that was 1,000 times larger than the actual conflict rate, just so they wouldn’t have to keep track of so many zeroes. The blue sliver does not represent actual injuries. There were zero. It represents what researchers call “minor conflicts.” Out of 12,587 bikes and almost 20,000 cars, there were six. In contrast to a similar study of colored bike boxes, the low-cost solutions some cities have used to reduce right-turn conflicts at stop lights, this study of 10 protected lane intersections released Monday observed zero major conflicts, the sort that involve rapid brakes or swerves by bikes or cars. The rates were miniscule both at intersections that use traffic signals to separate all bike and car turning movements and at intersections that allow turning cars to cross or merge with the bike lane. Why do they work so well?Jennifer Dill, a co-author of the new study from Portland State University’s National Institute for Transportation and Communities, said one of the most important reasons is simple: they’re busy. As we wrote yesterday, these intersections aren’t just busy with cars. They’re also busy with bikes. And that’s because the protected lanes are more than just statistically safe. They’re comfortable. Source: Portland State University study, June 2014. If you like painted bike lanes, you probably love protected bike lanes. That’s another key finding from this week’s study, which surveyed 1,111 users of eight protected lanes in five cities around the country and 2,301 people who live near them. Among people whose most important reason for not using a bicycle for transportation is that they feel uncomfortable on the streets — a vast swath of city-dwelling Americans that Portland Bicycle Cooordinator Roger Geller dubbed the “interested but concerned” in a famous 2006 white paper — there’s been scientific evidence for a few years that painted bike lanes make them feel slightly more comfortable. As cities across the country have followed Portland’s lead by striping major streets with bike lanes, the science has been verified on both counts: the share of urban bike commuters has risen just about everywhere … slightly. Now, Monday’s study offers scientific evidence that protected bike lanes make the same group of Americans feel more comfortable. 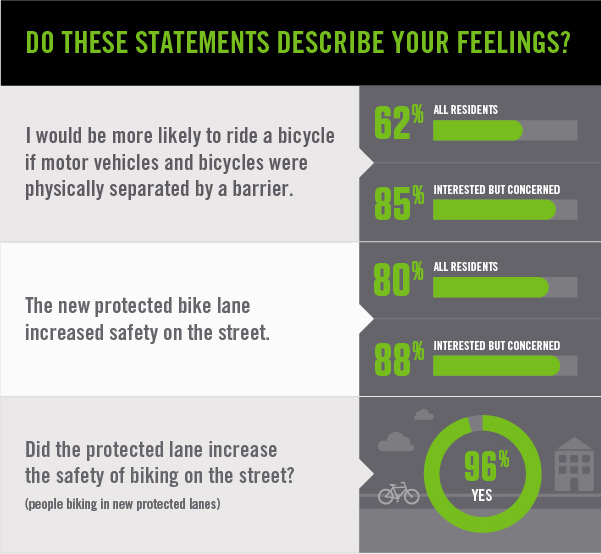 Fully 96 percent of people surveyed while riding in protected bike lanes said the plastic posts or parked-car barriers increased the safety of biking in the street. In fact, so did 80 percent of nearby residents, whether they ride a bicycle or not. Among nearby residents identified as “interested but concerned” — that is, people who either currently bike for transportation but feel uncomfortable riding in painted bike lanes on major streets, or who want to bike more despite feeling uncomfortable in painted bike lanes — the feeling of increased safety was particularly strong: 88 percent of those people said the protected lanes were safer. Even among people who said they had previously experienced a “near collision” while riding in the protected lane, 94 percent said the protected lanes had made the streets safer than they were before. Separation barriers don’t need to be fancy to get the job done. The safety-related findings in Monday’s study don’t mean that good protected lane intersections are a snap to design, and they don’t mean that no one has ever been hurt in them; every type of intersection sees some injuries. But the lack of any significant conflicts among 12,000 bikes observed, combined with the fact that 96 percent of people who are actually using the lanes report them to be safer, should nail the coffin of any suggestion that because they sometimes require cars to turn in front of bikes, protected lanes are inherently unsafe. They’re not.